Isn’t this the cutest spider ever?! My son made it in a crafty cooking class for preschoolers this past summer. I love how they attached it to a string. I plan to hang it from a giant spider web as a fun Halloween decoration – the kind you can get in a bag and then you pull it apart! Check out the Oreo Spiders Snacks they also made and our handprint spiders archive! We would love to connect with you! You can find us here too: Facebook | Twitter | Pinterest | Instagram! What a fun idea. We&#39;re featuring your post on Share It Saturday this week over at Sugar Aunts. Thanks for linking up! 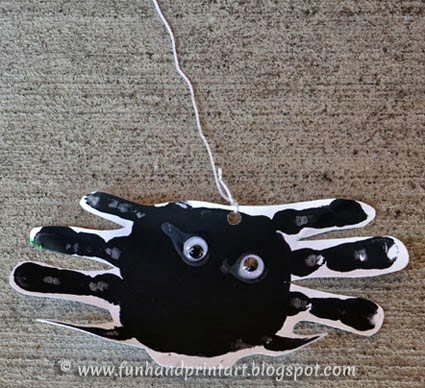 I very much do not like real spiders, but this is a really cute craft project just in time for Halloween. Thank you for sharing and for linking up this week to the Thoughtful Spot Weekly Blog Hop.